The pinnacle of the Pixar legacy happened five years ago with “Toy Story 3”, the second sequel to one of their films. Both the Toy Story sequels were outstanding, so I do not subscribe to the theory that Pixar’s decline is attributable to a loss of originality, illustrated by it’s willingness to do sequels. While I have detected a decline myself in the quality of their films, there has been only one that I consider an outright failure: “Cars 2”. “Monsters University” has a lot to offer, and “Brave” although a lot more conventional than their other films, was still spectacular to look at and very entertaining. 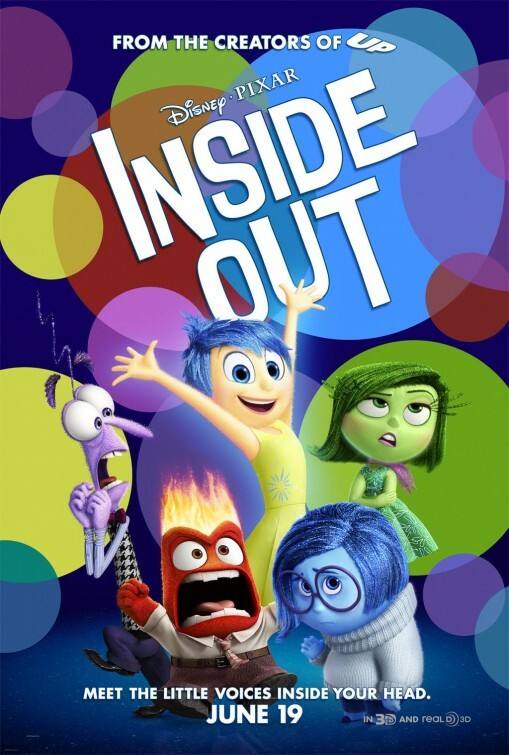 So five years and three films after their peak, Pixar is attempting to reach back to their greatest creative period with an original idea and some amazing visualizations, and they almost reach the brass ring but it falls just outside of their grasp with “Inside Out”. I think the film will work for most people and there is nothing in it that I can say fails. Every sequence is clever, the jokes all seem to work, and there is a line of thought that is trying to hold the story together so that it is coherent. Frankly, my wife loved it and I rarely challenge her on something like this because, well, she is usually right. I can’t say she is wrong here, I can only say that it did not reach me the way so many other Pixar Films have. The fantasy elements get mixed in with the science theory ideas and they just don’t fill in all the gaps the way I would want them to. This is not a negative review, but it probably will be much more muted than you will see elsewhere, and it’s a little hard to put my finger on why. One reason might be that the film is marketed to a younger audience, it is animated and it is Disney/Pixar after all, but the concepts seem to be a little more sophisticated than a family movie can handle. The idea behind core memories and personality and their relationship to emotions is a complex concept. It would be hard to explain in a psychology class over the course of a sixteen week semester, much less making it clear in a 94 minute cartoon. The function of long term memory and the personality islands that populate the scenery in this film is frankly confusing. I also thought that the story did not stay true to the rules it was creating as it went along. The memory dump is inescapable, until it isn’t, and the personality islands get repopulated faster than a Disney character gets brought back from the dead in one of the traditional fairy tales. After having set up the complex workings of the brain, it just felt at the end as if those complexities don’t really matter once we get our emotions in line. The clearest message of the film is that we need all of our emotions. Joy does not mean much without sadness, and anger may be the only way to overcome fear at times. I think that if the film had followed the emotions interactions more and built a story around that community, the movie would feel more complete and there would be a stronger narrative. There are so many side trips that this movie makes that it is easy to lose focus of the main goal. By reducing all of the emotions to five characters, it cuts down on complexity there, but think of where the story could have gone if it was about the way all of the emotions had to try to live with each other while still doing their jobs. I really admire the creativity and orginality of the concept and the characters, I just thought the plot was confusing because of the roads those characters were sent down. Kids will be afraid of their sub-conscious mind after watching this, and the notion of their dreams being turned into nightmares might also be a bit disturbing. I admired all the individual sequences and ideas, “the Train of Thought” is a great way to travel through the brain, but it does not seem to do anything but act as an obstacle for the two main emotions to overcome. The different levels of abstract thought were brilliantly conceived, Picasso would probably sue. I thought the surface story of Mom, Dad and Riley was visually interesting as well. Apparently the folks at Pixar can recognize some of the faults of San Francisco thinking as well as the rest of us, broccoli does not belong on pizza. When I see this down the road, I might have a different impression. Maybe my expectations were off, or my own emotions were asleep or lost in the sub-conscious during the film. Honestly, it is not hard to reach me emotionally. I have teared up at a Jackie Chan movie (the stuff that guy can do makes me cry tears of joy), but “Inside Out” left me with only a mild amount of pleasure and no deep emotional resonance. For a story about the emotions, that seems like a miss.